When you publish your resume, you can set it to 'Public', 'Unlisted', or 'Export only'. 'Public' resumes are visible to anyone and they will appear in search results. For example, your online resume will appear when someone uses Google to search your name. Please note that only one CV can be set to 'Public' at a time. 'Unlisted' resumes can not be found with search engines. They can only be found with a direct URL. This means that if you share a link to your resume with email or social media, people following the link will be able to see it. People using a search engine to find you, however, will not. A direct link is required. 'Export only' resumes are intended to be exported to PDF and shared as documents, rather than using the URL. While the PDF URL can still be shared, it will not appear in search results - a direct link is required to find it. Please note that this setting will cause the 'Share' button at the top of the editor to disappear, as the URL is no longer viewable. To change the privacy setting on your resume, click the Settings tab. Inside the Settings modal, use the Resume Type menu to choose your privacy setting. Be sure to click Save to save your changes. 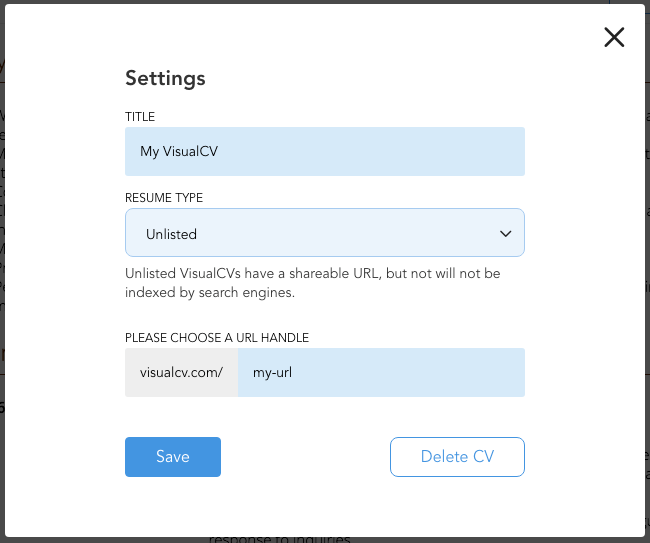 Tip: You can also use this modal to change your resume's title and URL.